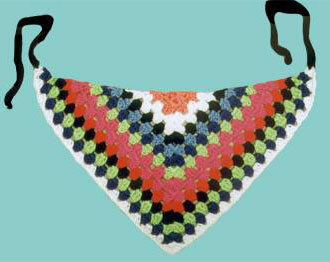 A perfect summertime cover up, the trendy triangle head scarf is all the fashion rage. You can Make It Quick!, combining different yarn colors, like our granny square version, or make it a solid color. With first color, ch 3. In first ch work 2 dc, ch 1, 3 dc. Ch 3, turn. Row 2: Work 2 dc in last dc of last row, ch 1, work (3 dc, ch 1, 3 dc) in ch-1 space, ch 1, 3 dc in last dc. Join new color and ch 3. Row 3: Work 2 dc in last dc of last row, ch 1, 3 dc in ch-1 space, ch 1, work (3 dc, ch 1, 3 dc) in corner ch-1 space, ch 1, 3 dc in ch-1 space, ch 1, 3 dc in last dc. Ch 3, turn. Row 4: Work 2 dc in last dc of last row, (ch 1, 3 dc in ch-1 space) twice, ch 1, work (3 dc, ch 1, 3 dc) in corner ch-1 space, (ch 1, 3 dc in ch-1 space) twice, ch 1, 3 dc in last dc. Join new color, ch 3, turn. Rows 5-15: Continue as established, working (ch 1, 3 dc) in each ch-1 space, and (ch 1, 3 dc, ch 1, 3 dc) in each corner. Change colors at end of each row or alternate row as shown or as desired. Straps: With black or color of choice, join to corner and ch 60. Sc in 2nd ch from hook and in each ch across. Fasten off and weave in ends. Repeat on other side.